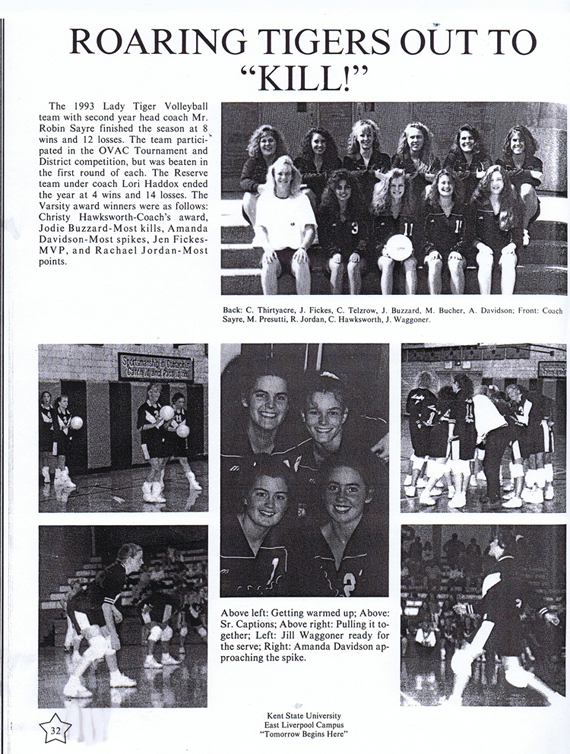 ELHistSoc -Growing up, From "Tomboy" to Successful Head Women's Volleyball Coach at a Div III College 2. 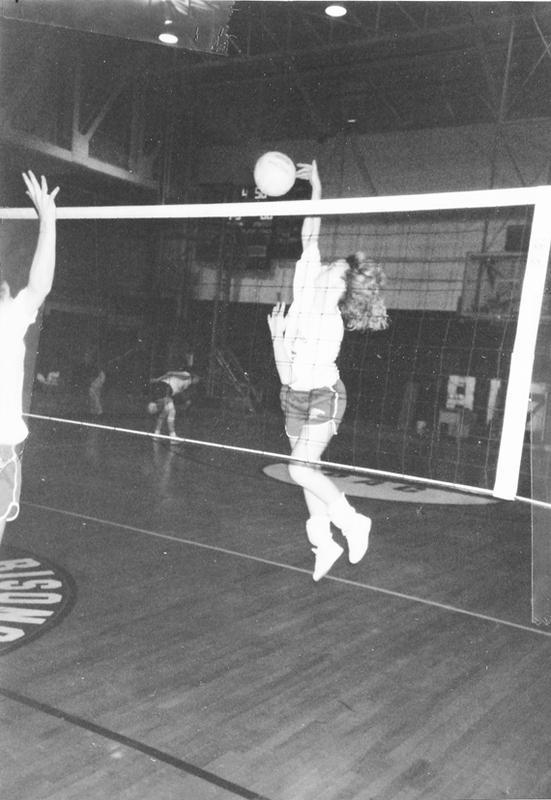 As a player, Pietryk was a three-time PAC All-Conference volleyball player at Bethany College. She was also a two-time All-Conference performer in softball. Bethany Robin Sayre Spiking the ball. Bill Hanna Award - 1989-90: Outstanding Female Athlete. 1991 - Honored by Upper Ohio Valley Dapper Dan Club for Outstanding Achievement. The first interview didn't really cover her college sports playing career, thus we conducted a second phone interview. WE: What is OH in Volleyball? ROBIN: Outside Hitter. It's just a position. WE: In general and simplified what are the responsibilities and duties if any? ROBIN: Mostly, the primary responsibility is offensively as a hitter, Secondary responsibility is defensively and that's where the digs come in. WE: and I don't know what that is either? ROBIN: A dig is anything that is passed up from a hard spike or an overhead hand attack. ROBIN: Yes, well yes, it's the first hit. WE: Greg Adkins was trying to tell me something the other night at a track meet, but it wasn't totally clear. He was trying to explain that he thought you have achieved something a bit unique in your freshman year at Bethany. Do you have any idea what he was talking about? ROBIN: The only thing I can think of that he was talking about was lettering in general. I earned twelve letters while I was in college. I lettered all four years in my three sports. That's unusual to have happen. It is unusual for people to play three sports. It was something I was able to do because I was in a Division III School. In fact, the school I am at [North Carolina Wesleyan College - Webmaster], we have no one who has lettered in three sports. In Division I and Division II, they tell you that you can only play one sport. WE: What is the Presidents' Athletic Conference All-Star Team? ROBIN: The Presidents' Athletic Conference was the Conference we were in. WE: How many letters were you awarded in high school. I counted 11. ROBIN: : I think that's right. Basketball in my ninth grade year was still considered junior high. We had moved up to the high school but they kept the ninth grade basketball team. WE: So it wasn't varsity or even JV? ROBIN: it wasn't that year. Why they kept the ninth grade team that year, I don't know. That was the only year they did that. WE: Based on the information I gathered from the yearbooks you should've lettered in track and volleyball your freshman year. WE: Then you would've lettered in your three sports for the next three years. WE: Who is Bill Hanna and what is the award named after him? ROBIN: : It was just who the award was named after and honestly, off the top of my head, I don't know. It was the name of the award. It was for the outstanding female athlete of the year and it was only given to a senior. WE: How tall are you? In some yearbook pictures you appear to be quite tall while in others, not so tall. ROBIN: I don't know anymore. I guess about 5'9". It's not real tall. If I was standing beside Abby Tice I probably looked very short. It is amazing some of the things you can find. We found a whole table full of notebooks that contained newspaper clippings in them at the ELHS Alumni Association. Each notebook representing a specific year. In the 1985-86 school year notebook we found the above picture. The clippings are encased in plastic so there is a reflection but it does show Abby Tice, #40 and Robin Sayre #44. Abby is taller but Robin does not appear to be that much shorter. WE: Do you have any college pictures? ROBIN: You know what, I am sure I do but I haven't looked yet. I have to go back and dig out some old articles because I don't know if there was anything in the yearbooks so I have to look through them. I am sure I have something. I don't remember that they took a whole lot of pictures but I don't know why. WE: I see you were honored by the upper Ohio Valley Dapper Dan club for outstanding achievement. ROBIN: Yes, I think that was based on that District II GTE Academic All-America that I received for softball in 1990. WE: You were nominated for basketball. ROBIN: Yes, I was just nominated for that but I didn't get it. I probably didn't have the statistical part; I had the academic part but probably didn't have the statistical part for that one. Basketball wasn't my best sport of the three I played. WE: Were you the head coach at East Liverpool high school for softball one year? ROBIN: I think it was one year; I coached volleyball, maybe two years at the Wellsville High School. WE: That's new information. That isn't in your Hall of Fame bio. Do you remember which years? ROBIN: Robin: I really don't. It was right after I got out of college. WE: I am a real novice when it comes to understanding these volleyball terms. ROBIN: They use different terminology. It's somewhat hard to explain without demonstrating. In fact, with the volleyball scorebook, well to be honest, I don't know how to keep score in that volleyball scorebook. ROBIN: I could not sit down and do the scorebook. ROBIN: It is and they laugh about it. The people I work with know I don't know how to do it. It's very complicated and I've never been on that end of it. I can do a basketball scorebook better than I can do volleyball scorebook. we: In your Hall of Fame bio it says, "at Bethany she was named to virtually every Presidents Athletic Conference All-Star team in each of her major sports". ROBIN: I guess I never heard that. I don't know that they ever asked me anything about that. I don't think that came from me. WE: Do you know who interviewed you? ROBIN: I don't remember anyone interviewing me. I didn't even know I got it until I got the letter in the mail telling me I had been nominated and approved. I know that my parents knew. Somebody had said something to them, but they didn't say anything to me until I got the confirmation. I had already moved to Illinois and started my coaching there at McMurray and had to come back for it. I didn't know that I was ever interviewed or said anything to anyone. I don't know where any of the information came from. I don't remember them asking. The only thing it might be, and I don't know if anyone asked this person or not, but my college coach, the one who actually recruited me went to Beaver Local. Her name was Lisa Campanell. That's Lisa Campanell Komara now. She actually recruited me and she graduated from Beaver Local. WE: Did she play volleyball? ROBIN: I don't think she did. She was really big into basketball. It was one of those things where volleyball wasn't taken as seriously as basketball. That was her primary thing, basketball that is. It was "oh, you can help out. You can do volleyball too." It was one of those things that they did back at that time. Now, they have people that stick to one sport, that's their specialty sport. They played that, done that. At the time when I was coming through, a person who may have coached volleyball might not have ever played it in high school or college. I know she was big on basketball. I was probably hired primarily for basketball. They probably told her you can help coach volleyball too. They don't do that anymore. The are the more individualized now. WE: Any reason you know of why you were MVP some years and not others? ROBIN: I think it was mostly my junior and senior years, If I am correct. WE: Volleyball captain 88 - 89. Team MVP 88 - 89. ROBIN: Eighty-nine would have been my senior year because volleyball is done in the fall. Even though I graduated 90 volleyball would've taken place in 89. So I'm thinking and looking at it, that would have been Junior and Senior years. WE: You do have 1990 in a couple places like for example softball. ROBIN: Yes, because softball is in the spring. To be honest with you I tend to forget things so I had a couple plaques that had that information on them. So the list of college achievements came from those plaques as I would never have remembered off the top of my head. I had to pull the plaque off the wall and look at it. It was for my senior letter. WE: Do you have trophy room? ROBIN: (Laughing) no, I got rid of all the trophies. My kid's trophies are the ones count now. WE: Well, it's their turn. ROBIN: yeah, I think mine are setting in a box up in the attic but I do keep some of my bigger, better plaques from my college years and some of that is in my office. WE: Any idea what your records were at Wellsville while you were coaching there? ROBIN: I'm not positive. I do know that either it was my first year or second year there that we won the OVAC. There was a tournament for our division. We went and played in the tournament and there were four teams involved. We won the tournament, so we had to be good enough to be one of those four teams. WE: This was softball and Wellsville? ROBIN: No, it was volleyball. They didn't have softball at Wellsville at that time. When I went to school they didn't have softball at Beaver Local either. 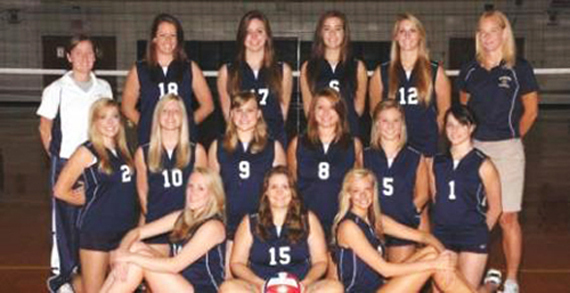 WE: The Evolution of Female Sports at ELHS sort of dried up. I've not gotten or found any new information. ROBIN: I liked reading what you had. That was good. A lot of what is there I didn't know. WE: Well, I don't have all the Merrill Hall winners yet, nor years they one. They won their awards their senior year, right? ROBIN: Yeah, it was a senior award. WE: The girl who was a sophomore when you were a senior who went to Bethany? WE: Did you help get her there? ROBIN: : I don't know that I technically did. It was nothing that I ever asked that she headed in that direction. I'm sure the coach recruited her and may have mentioned something. We never talked about it so I'm not sure if she came there because of me or she knew someone else there. It may have had some influence because basically prior to me going there no one had gone there from East Liverpool in some time. After I went to Bethany there were several people, girls and boys, who came in after me. So I don't know if East Liverpool just started getting recruited a little bit more from that school or I kind of opened the door to the new school that nobody had heard of. I'm just not sure. WE: Were you and she friends in high school? ROBIN: Lori? Yes. We were really good friends in school and I still keep up with her. WE: Have you maintained contact with a lot of those girls you played with in high school? ROBIN: Some of them. There really weren't any female athletes in my class. There were a lot of good male athletes but there weren't any female athletes. So the class before me, which was the class Greg Adkins graduated in, that class, had several female athletes as did the class that graduated after me. So the female athletes I was around were mostly younger or older than me. Some of them I do keep in touch with though I am not one to keep regular tabs on everybody. From Facebook, I know where a lot of them are, what they are doing, I touch base with some of them. Newspaper clipping from 1085-86 school year. Assistant Girls Basketball Coach, 1990-91 East Liverpool High School. Coach Robin Sayre top row left hand side of picture. The E.L.H.S. Girls' Reserve Basketball Team ended the season with a terrific 15-4 record. With the present team returning and upcoming freshman the 1991-92 season will continue to show progress. With the present coaching staff intact our future projects should be exciting and successful. The coaching staff consists of head coach Gary Steffen and assistant coaches Stephanie Coie and Robin Sayre. Robin Sayre also coaches the reserve team. The team consists of Erin Schmidbauer, Michelle Webb, Missy Wilson, Allison Truman, Cathy McClintock, Milli Sayre, Annie Wolfe, Jennifer Forbes, Pam Lindensmith, Kim Lindensrnith, and Christa Wolfe. 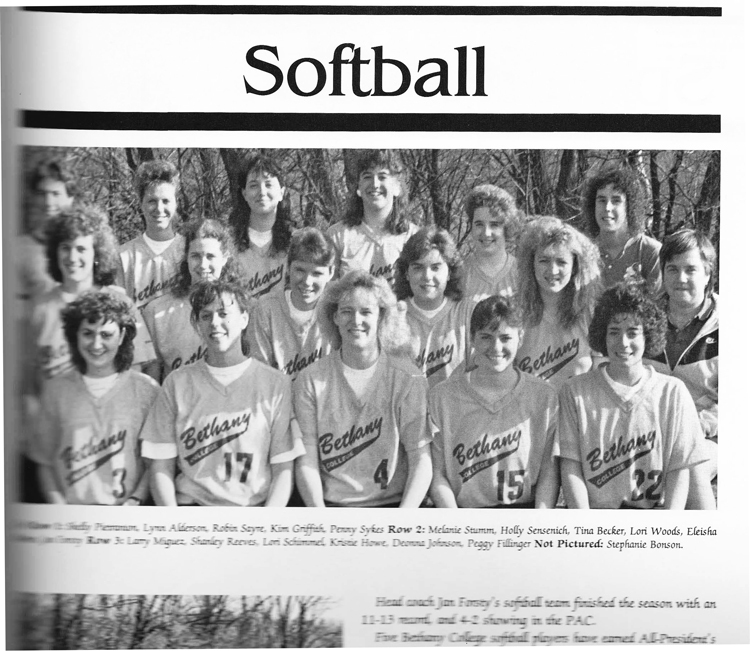 Head Coach, Softball Team, 1991-92, East Liverpool High School. 3-18 Record. Head Volleyball Coach, 1992-1993, Wellsville High School. 10-11 record, OVAC Sectional win, loss in the district. Wellsville 1992-93 Year Book. I wish to thank Linda Rolley and the rest of the Wellsville High School Office staff for their assistance. Head Volleyball Coach. 1993-1994, Wellsville High School. 8-12 Record, lost in first round of OVAC Tournament play. Wellsville 1993-94 Year Book. I wish to thank Linda Rolley and the rest of the Wellsville High School Office staff for their assistance. 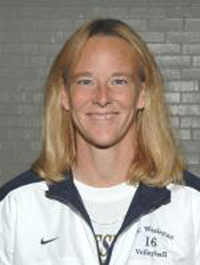 Coach Pietryk has made a reputation of building programs, having taken over struggling teams at her previous two collegiate stops and making vast improvements with each in both the win column and in conference play. She started her collegiate coaching career at MacMurray College in Jacksonville, IL where she was named the St. Louis Intercollegiate Athletic Conference Coach of the Year in 1995. From there, Pietryk moved on to Defiance College in Defiance, OH. Once again, her teams continued to improve in the win column, setting the stage for her move to Wesleyan. Robin Pietryk enters her 13th year at the helm of the North Carolina Wesleyan volleyball program. The Bishops’ career leader in volleyball coaching wins, Pietryk’s tenure has seen her establish NCWC as a legitimate contender for the USA South Conference title. [ROBIN] I have also attached a picture taken by Carl Lewis at a match this past season. He takes the pictures with his wife Dr. Jackie Lewis and she gave me permission to use whatever I wanted. I'm not positive which one took this picture, but I believe it was Carl. In 2011, Pietryk’s squad turned in its fifth consecutive 20-win season, while 2009 and 2010 saw her team make back-to-back appearances in the USA South Tournament Championship. In 2008, she led her Bishops to the one of the best seasons in program history with a 26-8 overall record, including a 15-3 mark in USA South play. The 26 victories tied the program record for wins in a season, while the 15 league victories were also a program-best. Pietryk currently boasts over 200 career wins and has guided 18 players to All-Conference honors. Her tenure has seen the veteran coach record five of the program's seven 20-win seasons, the first of which came in 2004 when she guided the Bishops to a 22-11 overall record. Three years later, the 2007 season saw Pietryk record her 100th career win at NCWC and lead the Bishops to a 21-14 mark. She received her bachelor’s degree from Bethany in 1990 and completed her Ph.D. in the spring of 2008 at Walden University, specializing in higher education. In addition to her coaching duties, Pietryk also serves as an academic instructor for the College. She and her husband, John, have two sons: Christopher and Jeremy. We hope to have additional interviews with other women who played at ELHS. We are especially interested in those who played in the early years of the modern era, 1973-74, though 1979-80. However, even current Lady Potters athletes are welcome.